John Alan Lasseter (/ˈlæsətər/; born January 12, 1957) is an American animator, filmmaker, and former chief creative officer of Walt Disney Animation Studios, Pixar and the defunct Disneytoon Studios. He was also the Principal Creative Advisor for Walt Disney Imagineering. Lasseter began his career as an animator with The Walt Disney Company. After being fired from Disney for promoting computer animation, he joined Lucasfilm, where he worked on the then-groundbreaking use of CGI animation. The Graphics Group of the Computer Division of Lucasfilm was sold to Steve Jobs and became Pixar in 1986. Lasseter oversaw all of Pixar's films and associated projects as executive producer. In addition, he directed Toy Story (1995), A Bug's Life (1998), Toy Story 2 (1999), Cars (2006), and Cars 2 (2011). From 2006 to 2018, Lasseter also oversaw all of Walt Disney Animation Studios' (and its division Disneytoon Studios') films and associated projects as executive producer. The films he has made have grossed more than $19 billion (USD), making him one of the most successful filmmakers of all time. Of the seven animated films that have grossed more than $1 billion, five of them are films executive produced by Lasseter. The films include Toy Story 3 (2010), the first animated film to pass $1 billion, Frozen (2013), the current highest-grossing animated film of all time, as well as Zootopia (2016), Finding Dory (2016), and Incredibles 2 (2018). He has won two Academy Awards, for Best Animated Short Film (for Tin Toy), as well as a Special Achievement Award (for Toy Story). In November 2017, Lasseter took a six-month sabbatical from Pixar and Disney Animation after acknowledging "missteps" in his behavior with employees. According to various news outlets, Lasseter had a history of alleged sexual misconduct towards employees. In June 2018, Disney announced that he would be leaving the company at the end of the year when his contract expired, but would take on a consulting role until then. On January 9, 2019, Lasseter was hired to head Skydance Animation. 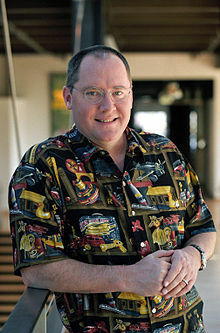 Lasseter was born in Hollywood, California. His mother, Jewell Mae (née Risley; 1918–2005), was an art teacher at Bell Gardens High School, and his father, Paul Eual Lasseter (1924–2011), was a parts manager at a Chevrolet dealership. Lasseter is a fraternal twin; his sister Johanna Lasseter-Curtis, who became a baker based in the Lake Tahoe area, is six minutes older. Lasseter grew up in Whittier, California. His mother's profession contributed to his growing preoccupation with animation. He often drew cartoons during church services at the Church of Christ his family attended. As a child, Lasseter would race home from school to watch Chuck Jones cartoons on television. While in high school, he read The Art of Animation by Bob Thomas. The book covered the history of Disney animation and explored the making of Disney's 1959 film Sleeping Beauty, which made Lasseter realize he wanted to do animation himself. When he saw Disney's 1963 film The Sword in the Stone, he finally made the decision that he should become an animator. Lasseter heard of a new character animation program at the California Institute of the Arts (often abbreviated as 'CalArts') and decided to follow his dream of becoming an animator. His mother further encouraged him to take up a career in animation, and in 1975 he enrolled as the second student (Jerry Rees was the first) in the CalArts Character Animation program created by Disney animators Jack Hannah and T. Hee. Lasseter was taught by three members of Disney's Nine Old Men team of veteran animators—Eric Larson, Frank Thomas and Ollie Johnston—and his classmates included future animators and directors like Brad Bird, John Musker, Henry Selick, Tim Burton, and Chris Buck. During his time there, he produced two animated shorts—Lady and the Lamp (1979) and Nitemare (1980)—which each won the student Academy Award for Animation. While at CalArts, Lasseter first started working for the Walt Disney Company at Disneyland in Anaheim during summer breaks and got a job as a Jungle Cruise skipper, where he learned the basics of comedy and comic timing to entertain captive audiences on the ride. Upon graduating in 1979, Lasseter immediately obtained a job as an animator at Walt Disney Productions mostly due to his success with Lady and the Lamp. To put this into perspective, the studio had reviewed approximately 10,000 portfolios in the late 1970s in search of talent, then selected only about 150 candidates as apprentices, of which only about 45 were kept on permanently. In the fall of 1979, Disney animator Mel Shaw told the Los Angeles Times that "John's got an instinctive feel for character and movement and shows every indication of blossoming here at our studios ... In time, he'll make a fine contribution." At that same time, Lasseter worked on a sequence titled "The Emperor and the Nightingale" (based on The Nightingale by Hans Christian Andersen) for a Disney project called Musicana. Musicana was never released but eventually led to the development of Fantasia 2000. However, Lasseter soon realized something was missing: after 101 Dalmatians, which in his opinion was the film where Disney had reached its highest plateau, the studio had lost momentum and was criticized for often repeating itself without adding any new ideas or innovations. Between 1980 and 1981, he coincidentally came across some video tapes from one of the then new computer-graphics conferences, who showed some of the very beginnings of computer animation, primarily floating spheres and such, which he experienced as a revelation. But it wasn't until shortly after, when he was invited by his friends Jerry Rees and Bill Kroyer, while working on Mickey's Christmas Carol, to come and see the first light cycle sequences for an upcoming film entitled Tron, featuring state-of-the-art computer-generated imagery (CGI), that he really saw the huge potential of this new technology in animation. Up to that time, the studio had used a multiplane camera to add depth to its animation. Lasseter realized that computers could be used to make films with three-dimensional backgrounds where traditionally animated characters could interact to add a new level of visually stunning depth that had not been possible before. He knew adding dimension to animation had been a longtime dream of animators, going back to Walt Disney himself. Later, he and Glen Keane talked about how great it would be to make an animated feature where the background was computer animated, and then showed Keane the book The Brave Little Toaster by Thomas Disch, which he thought would be a good candidate for the film. Keane agreed, but first, they decided to do a short test film to see how it worked out and chose Where the Wild Things Are, a decision based on the fact that Disney had considered producing a feature based on the works of Maurice Sendak. Satisfied with the result, Lasseter, Keane and executive Thomas L. Wilhite went on with the project, especially Lasseter who dedicated himself to it, while Keane eventually went on to work with The Great Mouse Detective. Lasseter and his colleagues unknowingly stepped on some of their direct superiors' toes by circumventing them in their enthusiasm to get the Where the Wild Things Are project into motion. The project was cancelled while being pitched to two of Lasseter's supervisors, animation administrator Ed Hansen, and head of Disney studios, Ron W. Miller, due to lack of perceived cost benefits for the mix of traditional and computer animation. A few minutes after the meeting, Lasseter was summoned by Hansen to his office. As Lasseter recalled, Hansen told him, "Well, John, your project is now complete, so your employment with the Disney Studios is now terminated. ":40 Wilhite, who was part of Disney's live-action group and therefore had no obligations to the animation studio, was able to arrange to keep Lasseter around temporarily until the Wild Things test project was complete in January 1984, but with the understanding there would be no further work for Lasseter at Disney Animation. :40 The Brave Little Toaster would later become a 2D animated feature film directed by one of Lasseter's friends, Jerry Rees, and co-produced by Wilhite (who had, by then, left to start Hyperion Pictures), and some of the staff of Pixar would be involved in the film alongside Lasseter. Lasseter with George Lucas at the Venice Film Festival in 2009. Catmull later telephoned Smith that day and mentioned Lasseter was not working at Disney. Smith told Catmull to put down the phone and hire Lasseter right now. :45 Lasseter agreed instantly to work freelance with Catmull and his colleagues and joined them for a week of December 1983 on a project that resulted in their first computer animated short: The Adventures of André and Wally B. Because Catmull was not allowed to hire animators, he was given the title "Interface Designer"; "Nobody knew what that was but they didn't question it in budget meetings". Lasseter spent a lot of time at Lucasfilm in the San Francisco Bay Area in the spring of 1984, where he worked together closely with Catmull and his team of computer science researchers. :40–41 Lasseter learned how to use some of their software, and in turn, he taught the computer scientists about filmmaking, animation, and art. :40–41 The short turned out to be more revolutionary than Lasseter first had visualized before he came to Lucasfilm. His original idea had been to create only the backgrounds on computers, but in the final short everything was computer animated, including the characters. After the short CGI film was presented at SIGGRAPH in the summer of 1984, Lasseter returned to Los Angeles with the hope of directing The Brave Little Toaster at Hyperion Pictures. :45 He soon learned that funding had fallen through and called Catmull with the bad news. :45 Catmull called back with a job offer, and Lasseter joined Lucasfilm as a full-time employee in October 1984 and moved to the Bay Area. :45 Lasseter and Catmull's collaboration, which has since lasted over thirty years, would ultimately result in Toy Story (1995), which was the first-ever computer-animated feature film. Due to George Lucas's financially crippling divorce, he was forced to sell off Lucasfilm Computer Graphics, by this time renamed the Pixar Graphics Group, founded by Smith and Catmull, with Lasseter as one of the founding employees. It was spun off as a separate corporation with Steve Jobs as its majority shareholder in 1986. Over the next 10 years, Pixar evolved from a computer company that did animation work on the side into an animation studio. Lasseter oversaw all of Pixar's films and associated projects as executive producer. As well as Toy Story, he also personally directed A Bug's Life (1998), Toy Story 2 (1999), Cars (2006), and Cars 2 (2011). He has won two Academy Awards, for Animated Short Film (Tin Toy), as well as a Special Achievement Award (Toy Story). Lasseter has been nominated on four other occasions—in the category of Animated Feature, for both Monsters, Inc. (2001) and Cars, in the Original Screenplay category for Toy Story and in the Animated Short category for Luxo, Jr. (1986)—while the short Knick Knack (1989) was selected by Terry Gilliam as one of the ten best animated films of all time. In 2008, he was honored with the Winsor McCay Award, the lifetime achievement award for animators. Disney announced that it would be purchasing Pixar on January 24, 2006, and Lasseter was named the chief creative officer of both Pixar and Walt Disney Feature Animation, the latter of which he renamed Walt Disney Animation Studios. On January 25, 2006, Lasseter was welcomed by his new employees in Burbank with warm applause, as they hoped that he could save the studio from which he had been fired 22 years earlier. :253–254 Lasseter was also named principal creative adviser at Walt Disney Imagineering, where he helped design attractions for Disney Parks. He oversaw all of Walt Disney Animation Studios' films and associated projects as executive producer. He reported directly to Disney Chairman and CEO Bob Iger, bypassing Disney's studio and theme park executives. He also received green-light power on films with Roy E. Disney's consent. In December 2006, Lasseter announced that Disney Animation would start producing animated shorts that will be released theatrically once more. Lasseter said he sees this medium as an excellent way to train and discover new talent in the company as well as a testing ground for new techniques and ideas. The shorts will be in 2D, CGI, or a combination of both. Recent shorts have included Feast (2014) and Inner Workings (2016). In June 2007, Catmull and Lasseter were given control of Disneytoon Studios, a division of Walt Disney Animation Studios housed in a separate facility in Glendale. As president and chief creative officer, respectively, they have supervised three separate studios for Disney, each with its own production pipeline: Pixar, Disney Animation, and Disneytoon. While Disney Animation and Disneytoon are located in the Los Angeles area, Pixar is located over 350 miles (563 kilometers) northwest in the Bay Area, where Catmull and Lasseter both live. Accordingly, they appointed a general manager for each studio to manage day-to-day business affairs, then established a routine of spending at least two days per week (usually Tuesdays and Wednesdays) in Southern California. Lasseter is a close friend and admirer of Japanese animator Hayao Miyazaki, whom he first met when TMS Entertainment sent a delegation of animators to the Disney studio in 1981 and showed a clip from Miyazaki's first feature film, The Castle of Cagliostro (1979). Lasseter was so deeply moved that in 1985 he insisted on showing that clip and other examples of Miyazaki's work after dinner to a woman he had just met (who would become his wife). He visited Miyazaki during his first trip to Japan in 1987 and saw drawings for My Neighbor Totoro (1988). After Lasseter became a successful director and producer at Pixar, he went on to serve as executive producer on several of Miyazaki's films for their release in the United States and oversaw the translation and dubbing of their English language soundtracks. The gentle forest spirit Totoro from My Neighbor Totoro makes an appearance as a plush toy in Toy Story 3. Lasseter is a member of the Academy of Motion Picture Arts and Sciences and served nine consecutive years on its board of governors from 2005 to 2014 when he had to relinquish his seat due to term limits. His last position on the board was as first vice president. Lasseter received a star on the Hollywood Walk of Fame in Hollywood on November 1, 2011, located at 6834 Hollywood Boulevard. On November 21, 2017, Lasseter took a six-month leave of absence after acknowledging allegations of workplace sexual misconduct that he described as "missteps" with employees in a memo to staff. The alleged misconduct towards employees included "grabbing, kissing, [and] making comments about physical attributes." The alleged conduct became so well known that, according to Variety, at various times, Pixar had "minders who were tasked with reining in his impulses". On June 8, 2018, Disney announced that Lasseter would be leaving the company at the end of the year, but took on a consulting role until then. On January 9, 2019, three days before his 62nd birthday, Lasseter was hired to head Skydance Animation, which will produce animated films with Paramount Animation and Ilion Animation Studios. Lasseter drew the most widely known versions of the BSD Daemon, a cartoon mascot for the BSD Unix operating system. Lasseter owns the "Marie E." steam locomotive, a H.K. Porter 0-4-0ST saddle tank locomotive formerly owned by one of Walt Disney's "Nine Old Men", Ollie Johnston. The locomotive has made two visits to the Pacific Coast Railroad in Santa Margarita, CA in May 2007 and June 2010, where Lasseter ran the locomotive alongside the original Santa Fe & Disneyland Railroad "Retlaw 1" coaches. In 2005, Lasseter was given permission to bring the Marie E. to Disneyland as part of a celebration honoring Johnston. Johnston was able to take the locomotive around the Disneyland Railroad three times. This is the only time in history an outside locomotive has been permitted to operate on any of the Disney railroads. Lasseter brought his locomotive back to the Disneyland Railroad in June 2017 to celebrate the reopening of the railroad. 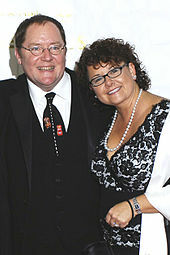 John Lasseter with his wife Nancy Lasseter at the 2006 Annie Awards red carpet at the Alex Theatre in Glendale, California. Lasseter lives in Glen Ellen, California with his wife Nancy, a graduate of Carnegie Mellon University, whom he met at a computer graphics conference in San Francisco in 1985. Nancy majored in computer graphics applications, and for a short period of time worked as a household engineer and as a computer graphics engineer at Apple Computer. They married in 1988, and have five sons, born between 1979/1980 and 1997. The Lasseters own Lasseter Family Winery in Glen Ellen, California. The property includes a narrow gauge railroad named the Justi Creek Railway (for the "Marie E.", the locomotive Lasseter purchased from Ollie Johnston) approximately 2 miles (3.2 km) long, including a train station and water tower Lasseter purchased from former Disney animator Ward Kimball. Their residence has a swimming pool with a lazy river that runs through a cave. Lasseter owns a collection of more than 1,000 Hawaiian shirts and wears one every day. Lasseter also inherited his late father's passion for cars; besides having directed two films about them, he watches auto races at Sonoma Raceway near his home and collects classic cars, of which one of his favorites is his black 1952 Jaguar XK120. On May 2, 2009, Lasseter received an honorary doctorate from Pepperdine University, where he delivered the commencement address. His influences include Walt Disney, Chuck Jones, Frank Capra, Hayao Miyazaki, and Preston Sturges. Lasseter's favorite film is Walt Disney's Dumbo. ^ a b O'Connor, Stuart (February 12, 2009). "How to tell a great toy story". The Guardian. Retrieved May 11, 2013. I was doing a lot of amateur 3D photography – in 1988, when I got married to my wife Nancy, we took 3D wedding pictures. ^ a b Craine, Anthony G. "John Lasseter: American Animator". Britannica.com. Archived from the original on October 27, 2016. Retrieved October 27, 2016. ^ Grover, Ronald (March 10, 2006). "The Happiest Place on Earth – Again". Bloomberg Businessweek. Retrieved April 20, 2012. ^ a b IMDb. "John Lasseter – Awards". ^ Masters, Kim (November 21, 2017). "John Lasseter Taking Leave of Absence From Pixar Amid "Missteps"". The Hollywood Reporter. Retrieved November 21, 2017. ^ a b Masters, Kim (November 21, 2017). "John Lasseter's Pattern of Alleged Misconduct Detailed by Disney/Pixar Insiders". The Hollywood Reporter. Retrieved November 24, 2017. ^ a b Zeitchik, Steven (November 21, 2017). "Disney animation guru John Lasseter takes leave after sexual misconduct allegations". The Washington Post. Retrieved November 21, 2017. ^ a b Barnes, Brooks (June 8, 2018). "Pixar co-founder to leave Disney after 'missteps'". CNBC. Retrieved June 9, 2018. ^ Baillie, Russell (June 3, 2006). "John Lasseter king of Toon town". The New Zealand Herald. Retrieved April 20, 2012. ^ "John Lasseter Addresses Graduating Class at Seaver College Commencement Ceremony". Pepperdine University. April 2009. Retrieved April 20, 2012. ^ "Jewell Risley Lasseter". The Whittier Daily News. November 1, 2005. Retrieved December 15, 2009. ^ a b c d e f Schlender, Brent (May 17, 2006). "Pixar's magic man". CNN Money. Retrieved April 20, 2012. ^ Siig, Melissa (January 11, 2013). "Bake Me a Cupcake: Cake Tahoe brings the cupcake craze to Truckee". Moonshine Ink. Retrieved May 8, 2014. ^ McCracken, Harry (1990). "Luxo Sr. – An Interview with John Lasseter". Animato. Retrieved April 20, 2012. ^ "CalArts Presidents - CalArts". CalArts. Retrieved June 9, 2018. ^ Garrahan, Matthew (January 17, 2009). "Lunch with the FT: John Lasseter". Financial Times. Retrieved April 20, 2012. ^ a b c Day, Aubrey (June 3, 2009). "Interview: John Lasseter". Total Film. Retrieved April 20, 2012. ^ King, Susan (December 10, 2013). "Walt Disney Animation Studios turns 90 in colorful fashion". Los Angeles Times. Retrieved September 2, 2014. ^ "Pixar Filmmaker John Lasseter To Receive "Contribution To Cinematic Imagery Award" From Art Directors Guild". Pixar. January 12, 2004. Archived from the original on December 5, 2010. Retrieved April 20, 2012. ^ "John Lasseter does AM Radio, too?". The Blue Parrot's perch. February 2, 2007. Retrieved April 20, 2012. ^ Musiciana — Walt's Inspiration for a Sequel to Fantasia (Bonus feature, Blu-Ray). Walt Disney Studios Home Entertainment. 2010. ^ Lyons, Mike (November 1998). "Toon Story: John Lasseter's Animated Life". Animation World Magazine. Retrieved October 13, 2010. ^ Lazarus, David (January 25, 2006). "A deal bound to happen". SFGate.com. Retrieved April 20, 2012. ^ Ghez, Didier (May 2, 1997). "Interview with Glen Keane". The Ultimate Disney Books Network. Archived from the original on February 6, 2012. Retrieved April 20, 2012. ^ Hill, Jim (November 28, 2007). ""To Infinity and Beyond!" is an entertaining look back at Pixar's first two decades". Jim Hill Media. Retrieved April 20, 2012. ^ a b c d e f g h i Paik, Karen (2007). To Infinity and Beyond! : The Story of Pixar Animation Studios. San Francisco: Chronicle Books. ISBN 9780811850124. ^ Kirsner, Scott (September 6, 2008). "Inventing the Movies". Retrieved June 9, 2018. ^ a b c d e Price, David A. (2009). The Pixar Touch: The Making of a Company. New York: Vintage Books. ISBN 9780307278296. ^ M. Buckley, A. Pixar: The Company and Its Founders. Google Books. p. 27. Retrieved April 20, 2012. ^ "Alvy Ray Smith: RGBA, the birth of compositing & the founding of Pixar". July 5, 2012. Retrieved June 9, 2018. ^ Gilliam, Terry (April 27, 2001). "Terry Gilliam Picks the Ten Best Animated Films of All Time". The Guardian. ^ Solomon, Charles (December 3, 2006). "Disney tries out new talent in an old form, the cartoon short – Business – International Herald Tribune". The New York Times. Retrieved April 20, 2012. ^ Lev-Ram, Michal (December 31, 2014). "A candid conversation with Pixar's philosopher-king, Ed Catmull". Fortune. Time Inc. Retrieved January 11, 2015. ^ a b c d Brzeski, Patrick (October 24, 2014). "John Lasseter Pays Emotional Tribute to Hayao Miyazaki at Tokyo Film Festival". The Hollywood Reporter. Prometheus Global Media. Retrieved November 10, 2014. ^ a b Kilday, Gregg (August 5, 2014). "Academy: Cheryl Boone Isaacs Reelected as President". The Hollywood Reporter. Prometheus Global Media LLC. Retrieved August 11, 2014. ^ Sperling, Nicole (November 1, 2011). "John Lasseter receives star on the Hollywood Walk of Fame". Los Angeles Times. Retrieved April 20, 2012. ^ "John Lasseter Taking Leave of Absence From Pixar Amid "Missteps"". The Hollywood Reporter. Retrieved June 22, 2018. ^ "John Lasseter Will Exit Disney at the End of the Year". Variety. Retrieved July 1, 2018. ^ "The BSD Daemon". FreeBSD. Retrieved April 20, 2012. ^ Pcrailroad at Gmail.Com (May 14, 2007). "Pacific Coast Railroad Co.: The 2007 Round-Up". Pcrailroad.blogspot.com. Archived from the original on April 26, 2011. Retrieved December 31, 2010. ^ "Lasseter winery coming into its own". September 24, 2011. Retrieved June 9, 2018. ^ a b "Trustees of Sonoma Academy 2011–12". Sonoma Academy. Retrieved December 25, 2013. ^ "VIDEO: 'A Day in the Life of John Lasseter' Read more: VIDEO: 'A Day in the Life of John Lasseter'". Stitch Kingdom. July 12, 2011. Archived from the original on March 22, 2012. Retrieved March 8, 2012. ^ Swartz, Jon (November 23, 1998). "Pixar's Lasseter – This Generation's Walt Disney". SFGate. Retrieved December 25, 2013. Lasseter says he depends heavily on his and wife Nancy's "own test audience" of five sons – ages 16 months to 18. ^ Boone, Virginie (September 26, 2011). "Lasseter winery coming into its own". The Press Democrat. Archived from the original on October 5, 2011. Retrieved October 7, 2011. ^ a b Roper, Caitlin (October 21, 2014). "Big Hero 6 Proves It: Pixar's Gurus Have Brought the Magic Back to Disney Animation". Wired. Condé Nast. Retrieved November 9, 2014. ^ Keegan, Rebecca (June 19, 2011). "Animated – and driven: For John Lasseter, Pixar's boyish visionary, 'Cars 2' is a gearhead's dream". Los Angeles Times. Tribune Publishing Company. Retrieved November 19, 2014. ^ "John Lasseter Addresses Graduating Class at Seaver College Commencement Ceremony". Pepperdine University. April 2009. Retrieved June 9, 2011. ^ Goodman, Stephanie (November 1, 2011). "'Pixar's John Lasseter Answers Your Questions'". Arts Beat. Retrieved February 20, 2014. ^ "Five Favorite Films with John Lasseter". Retrieved July 15, 2017. ^ "Beloved Pixar Characters Voiced by Pixar Filmmakers". Oh My Disney. August 26, 2016. Retrieved May 28, 2017. ^ Honeycutt, Kirk (October 14, 2010). "Tales From Earthsea – Film Review". The Hollywood Reporter. Retrieved December 27, 2013. ^ Kit, Borys (October 14, 2010). "Disney Picks Pixar Brains for Muppets Movie". The Hollywood Reporter. Retrieved November 24, 2011. ^ Celestino, Mike (July 14, 2017). "D23 EXPO 2017: "Toy Story 4" gets new director, new characters including paper doll Lulu". Inside the Magic. Retrieved July 14, 2017. ^ Khatchatourian, Maane (April 25, 2017). "Disney Dates 'Lion King,' 'Frozen 2,' Pushes Fifth 'Indiana Jones' Film to 2020". Variety. Retrieved April 25, 2017. ^ a b Simon, Ben (December 27, 2012). "Pixar Short Films Collection: Volume 2". Animated Views. Retrieved February 26, 2017. ^ ""PREP & LANDING: NAUGHTY VS. NICE," PRODUCED BY WALT DISNEY ANIMATION STUDIOS, AIRS MONDAY, DECEMBER 5 ON THE ABC TELEVISION NETWORK". ABC Medianet. Archived from the original on November 7, 2011. Retrieved November 12, 2011. ^ "Walt Disney Animation Studios' 'Feast' to Premiere at the Annecy International Animated Film Festival". Disney Post. April 24, 2014. Retrieved April 24, 2014. ^ Graser, Marc (September 2, 2014). "'Frozen' Characters to Return in 'Frozen Fever' Animated Short". Variety. Retrieved September 2, 2014. ^ Koch, Dave (June 20, 2014). "Inside Out Adds Animated Short". Big Cartoon News. Archived from the original on June 20, 2014. Retrieved June 20, 2014. ^ "Introducing Lou: Disney Pixar's Next Short Film". September 28, 2016. Retrieved June 9, 2018. ^ Connelly, Brendon (March 3, 2017). "Frozen, Trolls getting new TV specials". denofgeek.com. Retrieved March 10, 2017.